Revenue from ticket sales is not the primary source of income of sports organizations. Especially when it is compared to sponsorship deals, TV broadcasting rights, merchandising, and donations from local city or regional government. However, home-game attendance is a key factor that affects a club’s business strategy. 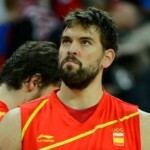 A Basketball club is first and foremost an entertainment brand in sports. Live games are the core entertainment product offered to its audience. Sponsors want exposure and will be more willing to support a club with strong fan following. City governments tend to sponsor teams which are valuable to local communities. Live game attendance also directly affects in-arena spending and merchandise sales. * The research includes gate receipts from VTB United League, Euroleague, ULEB Cup, FIBA Challenge Cup, Lithuanian, Latvian and Estonian domestic basketball championships. The research currently does not include domestic league income for Ukrainian, Polish, Belarusian and Czech teams, as the following leagues do not officially publish attendance numbers. CSKA Moscow and Zalgiris Kaunas top the list of the clubs with highest ticket revenue in North Eastern Europe, each earning more than 600,000 EUR from their home games in the first part of the season. Both clubs are clear leaders as they make at least twice as much per game as other clubs in the region. CSKA Moscow plays their regular seasons games in CSKA Sports Hall (built 1979) which can accommodate up to 5,500 spectators. It is a relatively small arena, but the economy of the region allows for high ticket prices of CSKA home games. Though the team is only 7th according to average attendance, their ticket prices allow CSKA to top the list of 2013 earnings. Zalgiris is the clear leader based on average attendance. The team plays in a newly built (2011) Zalgiris Arena, which can accommodate up to 15,688 spectators. They have a loyal fan following which produces stable attendance numbers despite subpar performances on the floor. Contrary to many teams on this list, Zalgiris does not play in the VTB League and relies on Euroleague for most of its ticketing income. Kaunas club only plays half of the Lithuanian championship regular season games. Average attendance for Russian teams was 2,462 spectators. Lokomotiv Kuban has the biggest following, attracting 4,731 fans per match. This makes it one of the most promising brands in Russian basketball. 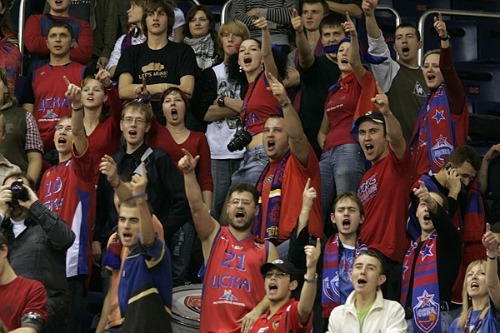 CSKA Moscow, UNICS Kazan and Krasnyi Oktyabr Volgograd also have healthy local support. Unfortunately, the numbers look grim for Khimky Moscow District. The club was saved from bankruptcy last season. 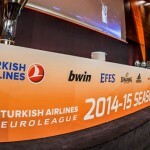 With a roster on par with Euroleague participants, the club only manages to attract 1,279 spectators per game. In business terms current attendance results are not sustainable. The team needs to adjust their ticket pricing and improve marketing efforts to at least double the attendance of home games. 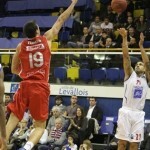 ČEZ Nymburk and PGE Turow are the bottom-ranked teams. They each earned less than 30,000 EUR. Both teams have modest local facilities and play more important games outside of their home towns. Nymburk is a 15,000-resident city, 50 kilometers away from Prague. The team plays half of their games in Sportovni Centrum (2,000) in Nymburk, but has to travel to Tipsport Arena (11,560) in Prague to play ULEB Cup and some VTB League fixtures. The home arena of PGE Turow in Zgorzelec (33,000 residents) holds only up to 1,300 supporters. The lack of proper sports infrastructure and small local communities makes European competition for these teams much harder. Tsmoki Minsk deserves a special mention as well. The team from Belarus has the 5th largest average attendance, but is only ranked 18th by average revenue per game. Due to lower consumer purchasing power Tsmoki has to attract more than 7,000 spectators to earn 10,000 EUR. For Kalev Tallinn in Estonia, it only takes 1,500 spectators. As teams compete in the same leagues, clubs from better economically developed countries are at a clear advantage. 10 Responses to "Attendance and revenue: Top NE European teams"
To Wojczyn: thanks for your remark! I was puzzled by Stelmet numbers as well. It turned out that due to misreading website in Polish, season ticket prices for Euroleague and ULEB were used instead of ticket prices per game. Thus the high average. Will fix this via update. 1. Data is quoted only from official league websites (Euroleague, ULEB Eurocup, VTB League, FIBA EuroChallenge and domestic tournaments). Polish, Ukrainian and Czech leagues do not provide official attendance numbers, thus this data is omitted from the research. 2. Ticket prices are quoted from official club websites or online ticketing services, which sell the tickets to club games. Different prices are accounted for different tournaments (VTB, Euroleague, domestic etc.) and vs different teams where applicable. 3. For each team we calculate the average ticket price based on the pricing of tickets in different arena sectors and the number of seats available in these sectors. The research estimates the average seat price in the arena. Though this model does not take into account the levels of occupancy in different sectors, it does provide accurate enough data for comparison purposes. The aim of this research is not to predict revenue with absolute certainty (this would be impossible via publicly available information), but to produce accurate enough numbers using the same methodology to see how the regional teams compare to each other. Please allow up to 5-8% error margin in the overall revenue estimates. 4. Though people tend to buy the cheapest tickets and clubs distribute many tickets for free, we cannot estimate these numbers for each team with a unified methodology. Therefore a theoretical model is used across the region. Either calculation is wrong or stats is wrong. I can believe full arenas in Lithuania, but not in other Eastern Europe with rare exception. CSKA stats is full of lies for sure, they have about 200-300 paying spectators at almost every game except Euroleague top teams and though tickets are 10-15 euros average, they hardly can make it 60 000 euros per game. Maybe 6k – that’s the correct number? Most of spectators buy cheap tickets for 2-3 euro and about 500 people get in for free. Same about almost every club in Russia, Poland, Czech Republic etc. Congratulations to the journalist. This article is worth to be published on the pages of Sports Business magazines! Teams in small cities has more chance to play totally packed gyms rather then the metropolises, but the attraction to basketball is related with the ticket prices. Very interesting story!! Like it a lot, provides very good info. Some tickets are far too expensive indeed. Interesting story. I think the tickets are too expensive at some region. I attended several games of Adriatic League and tickets were about 4-6 euros per game, and the arenas were full. I am glad too see full arenas in Lithuania, and I hope attendance will be higher in Russia and some VTB arenas.